LED fixtures consume 75% less energy than traditional incandescent bulbs. Due to the decrease in energy consumption your facility is guaranteed lower utility bills and overhead expenses. Your capital investment will quickly be met and provide higher returns. LEDs last 25 times longer than traditional lights so bulbs will require fewer maintenance repairs, allowing employees to focus on other tasks, increase productivity and minimize safety hazards. Lighting color can have an interesting impact on sales. For example, warm colors in your facility can create a feeling of familiarity, which can help to foster resident, employee and customer relationships. Well-lit parking structures and buildings can reduce the likelihood of errors and safety issues. For example, workers who have better lighting experience a lower risk of dropping and mishandling an object or work tool. Since LED lights last longer, they reduce the amount of waste that goes into landfills. The Organic Consumers Association reported that fluorescent lamps disposed of in U.S. landfills create enough mercury waste to pollute almost every body of water in North America. With lower energy costs, reduced maintenance and enhanced safety, LED’s are an option for any company wanting to lower expenses. To experience the full impact, contact us today and start saving! 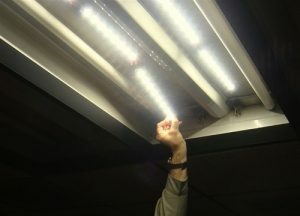 Click here to more about LED Retrofit services at J.R Electrical. Schedule online with us and we will get a Certified Atlanta Electrician right to your front door! Our team is available to serve you. J.R. Electrical is a premier electrical contracting company. We take care of your service needs as well as new/remodel construction. We offer lifetime warranties on workmanship and parts for homes and 1year warranties on commercial projects. You can always contact us via email or phone. We would love to hear from you! J.R. Electrical serves the entire metro Atlanta area for jobs both large and small! 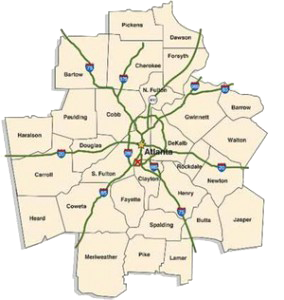 Here are the metro cities we serve with our Certified Atlanta Electricians! © 2016 JR Electrical. All Rights Reserved.